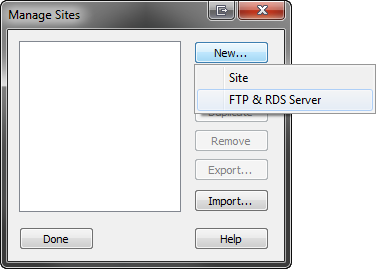 Click New, and then select FTP & RDS Server. Name — Enter a name for your Site. Access type — Select FTP. FTP host — Enter your domain name. For example, coolexample.com. Host directory — Enter your hosting account's directory. If the Site is for your primary domain name, type / or leave the field empty. Login — Enter your hosting account's user name. Select the files or folders you want to publish, and then click Put Files.